3D printing is making it's first big CES splash this year and MakerBot led the charge with an announcement of three new 3D printers in it's replicator line. Introducing its smallest printer in years, MakerBot lead off with a completely new addition, the MakerBot Mini. Bre Pettis, MakerBot CEO likened the mini 3D printer to the company's very first Cupcake CNC machine as both share the same 100 x 100 x 130mm build volume. Pettis position the new printer as their consumer level product with an easy "one touch 3d printing" to let users go from plugging in and start fabricating faster. The printer extrudes heated PLA plastic out of a smart filament head that automatically pauses the printing process when it's out of building material. MakerBot also put in a new upgrade in the form of a internal camera to allow 3D printers to easily take and share images of their creations from within the printer itself. 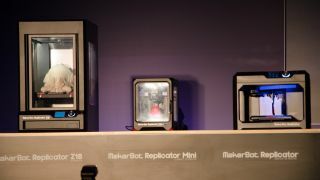 Pettis said MakerBot will begin shipping the Replicator Mini stating this spring for $1,375 (about £837/AU$1,535). Pettis posited if the MakerBot Replicator Mini is his consumer printer then the fifth generation MakerBot is its prosumer printer. The printer is not only more serious, it also creates larger 8 x 10 x 16-inch creations. Pettis imagines the printer will be used by Lockheed Martin and other more serious builds. The new MakerBot Replicator includes all the improvements made on the Mini printer plus a new 3.5-inch LCD interface. The new control panel includes a large metal knob fashioned after high-end audio equipment to help users neaturally navigate through the 3D printer's menus. In an even bigger 3D printer addition, Pettis took the wraps off of its tallest printer yet the MakerBot Replicator Z18. Sporting a tall build volume of 12x12x16in, the Z18 is meant for "industrial strength 3D printing." Putting numbers to the rampant popularity of 3D printing Pettis said MakerBot alone has shipped 40,000 plus 3D printers around the world. Meanwhile, Makerbot's online thingiverse has spawned more than 218,000 designs with 48,000 downloads. To help 3D print creators make money with their digital creation it launched the MakerBot digital store where users can sell "original, fun, and collectable digital content." Digital designs on the MakerBot Digital Store will begin at $0.99 (about £0.64/AUS $1.11) a pop and $9.99 (about £6.09/AUS $11.19) for collections. Looking further towards the future, Pettis also announced MakerBot entered a partnership with SoftKinectic, a maker of depth-sensing clothing, to create 3D scanners. MakerBot is also working on a project to bring 3D printers to over 100,000 schools in the United States in the hopes of educating more than 106,268 students around the country.